Fair allocation of the economic burden related to rapid decarbonization and climate damage mitigation will become a big topic within the next decade or two. 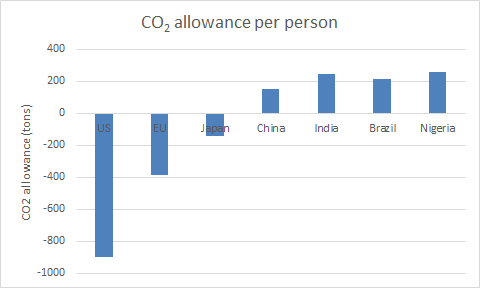 Perhaps the most equitable way of allocating this burden is by assigning a population-weighted cumulative CO2 budget to each country. In this case, the rich world is on the hook for enormous carbon debts thanks to a century of fossil fueled development. By the time that burden allocation becomes a major topic, developing nations will have the economic and political power (and the moral high ground) to demand accountability from developed nations. Climate change presents a global challenge, the likes of which we have never encountered before. It is fundamentally a long-term problem on the level of the global community, which is a big problem because us humans are short-term oriented and self-centered in nature. Personally, I will be (very pleasantly) surprised if we see broad deployment of meaningful climate change policies (e.g. CO2 prices above $50/ton) before climate change directly impacts a sizable portion of the population. This point may still be 10-20 years down the line. When this happens though, climate change will quite rapidly transition from being a long-term global problem to being a short-term local problem, spurring us into action. During the rushed implementation of climate change mitigation policies that will follow in this scenario, the most important question to answer is the following: how do we distribute the costs associated with rapidly slashing emissions and dealing with mounting climate change damages? This article will present a simple framework for achieving this climate burden allocation in an equitable manner. The proposed equitable framework is based on cumulative emissions, which is generally accepted to be almost linearly correlated to global temperature rise. A total global CO2 budget for achieving 2 deg C of temperature rise (about 2000 Gt of CO2) is evenly distributed between nations according to their populations and each nation is expected to balance this budget by the end of the century. 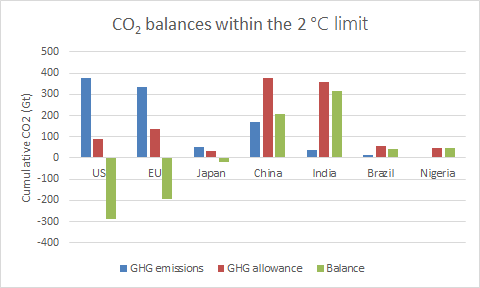 The resulting carbon budget balances for several large countries are shown below. Cumulative CO2 emissions balances for several large countries at the end of 2014 using data from the World Resources Institute. Clearly, the Western world (mainly the US and EU) are already way beyond their fair allocation of cumulative CO2 emissions. By the end of 2014, the US had already exceeded its budget by 330% and the EU by 140%, and these numbers will continue increasing over coming decades. Developing nations, on the other hand, still have large budgets left. 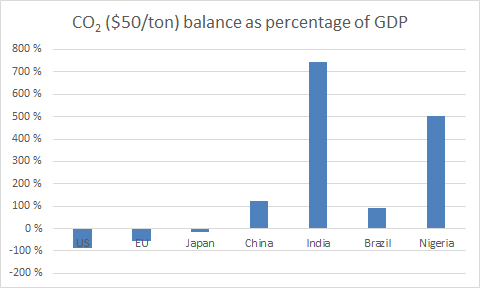 Even China, easily the largest global emitter at present, still has half its allocated budget, while India still has almost 90%. Another perspective is provided by expressing the current CO2 budget deficit or surplus per person. As shown below, the average US citizen was already in debt to the tune of 900 tons of CO2 in 2014, and is still adding to this debt at a rate of 15 tons/year. 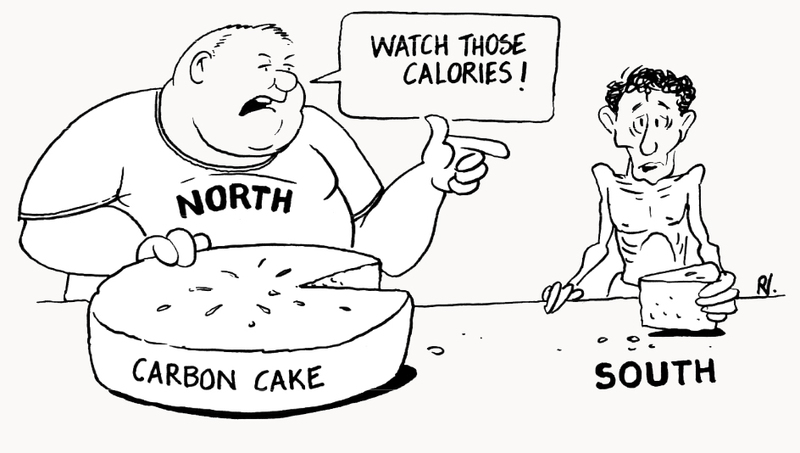 India, on the other hand) has a surplus of 244 tons per person, enough for 140 years at current emissions rates. Finally, it is informative to monetize this carbon debt/credit and express it as a percentage of GDP. When assigning a moderate value of $50/ton of CO2, the following results are obtained. In the US, carbon debt by the end of 2014 stood at 87% of GDP. One positive aspect is that the growth of this carbon debt is about the same as GDP growth, implying that the debt is unlikely to spiral out of control (as long as CO2 costs don’t rise significantly above $50/ton). For perspective, US government debt currently stands at 106% of GDP. The large carbon surpluses of developing nations, especially those with very poor populations like India and Nigeria, are again evident. Naturally, these ratios will shrink in the future, but these nations can still emit CO2 to fuel their growth for decades into the future without breaking their fair CO2 budgets. But is this really fair? Fair question. Slapping such a large retroactive debt onto developed world citizens may sound rather harsh at first glance. Keep in mind though that climate change was not just discovered yesterday. The potential threat of global warming was brought to public attention more than three decades ago. And most of the rich world carbon debt calculated above was accumulated after this point in time. Younger people today may also feel aggrieved about being saddled by this debt accumulated by previous generations. However, these people are encouraged to simply look around them at the economy that these previous generations have built for them while racking up this debt. Would they rather live in an underdeveloped economy with 5x less disposable income and much higher exposure to climate damages? I think not. In the end, it is an undeniable fact that current developed world citizens, both young and old, have benefited tremendously from their enormous historical CO2 emissions. It is also an undeniable fact that it will be developing world citizens who will suffer disproportionately from the climate change effects caused by the rich world’s historical CO2 emissions. Thus, if you ask me, a person born into a developed country has won big at the lottery of life, even when saddled with this carbon debt. I cannot see any sound argument why rich world citizens should be allowed more than their equal share of the global cumulative carbon budget. So, say that such a system based on cumulative historical emissions becomes broadly accepted. How will highly indebted developed countries pay back the world for the century of unabated fossil fuel emissions that created their superior standard of living? Sucking all of their historical emissions out of the atmosphere will not be practical in most cases. The more feasible arrangement would be to buy emissions credits from developing nations with large CO2 budget surpluses at a mutually agreed price. 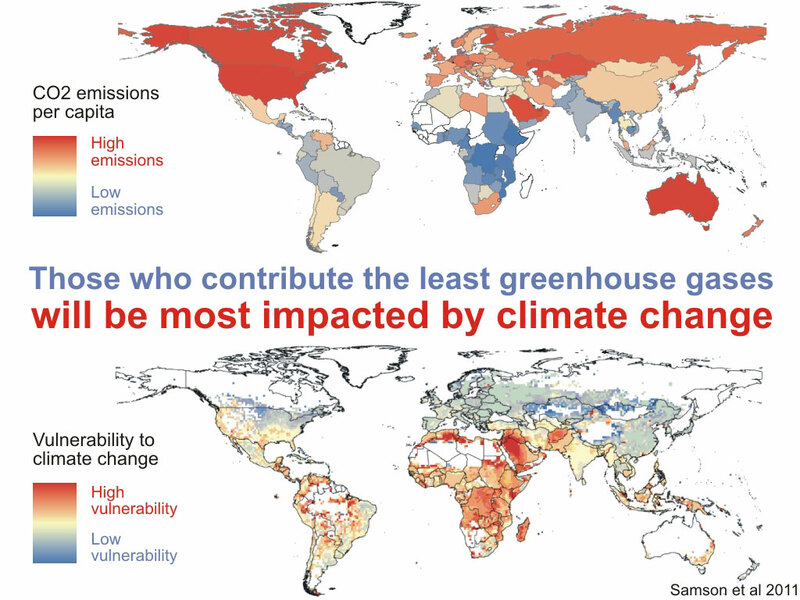 In this way, developed nations would very directly pay for the climate damages their historical emissions are (and will be) causing to developing world citizens. The price of these emissions credits will obviously be a major determining factor. It can be expected that prices increase over time as climate change damages become increasingly real and clearly attributable. The potential for very high CO2 trade prices is the biggest risk for developed nations in this system. As mentioned earlier, carbon debts will remain under control at $50/ton, but $100/ton or more (the expected cost of carbon-negative solutions) would be a totally different story. At present, definitely not. 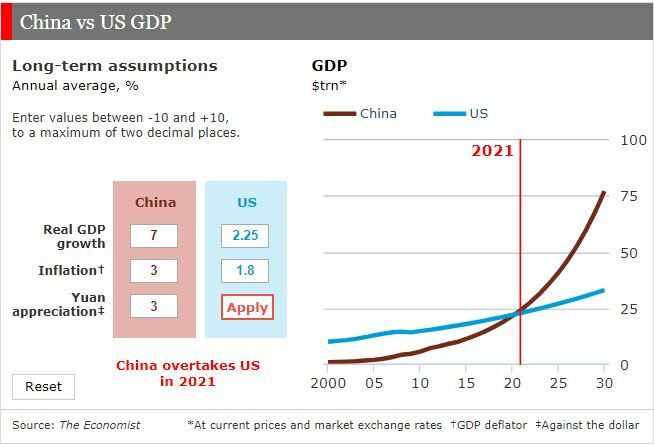 In the future, when the balance of economic and political power has shifted much more to the developing world, yes it could. I do not think there is any way that developing countries will allow the rich world to remain unaccountable for their historical emissions by the time that climate damages become a major item on national budgets. And by that time (maybe in the 2030’s), they will have the power to enforce this accountability, whether the rich world likes it or not. In addition to economic and political power, developing nations will also hold the moral high ground in this dispute. I therefore think that developed nations would do well to start considering the possibility that they will be expected to pay back their sizable carbon debts by the end of the century. Climate change brings an array of life-threatening consequences to underdeveloped nations in the form of famine, diseases and extreme weather. The well-developed economies of the rich world shield its inhabitants from these threats, but economic consequences such as property devaluation from rising sea levels and a potential influx of climate refugees can become substantial. The potential for the rich world being held accountable for historic emissions has not really entered the discussion yet. If developing nations decide to leverage their growing economic and political power to enforce such accountability, this will quickly turn into the greatest climate change consequence felt by the rich world. Personally, I think such a development is likely to occur over the next few decades. Developed nations will therefore do well to start preparing for such a scenario by decarbonizing their own economies and getting their public finances in order.